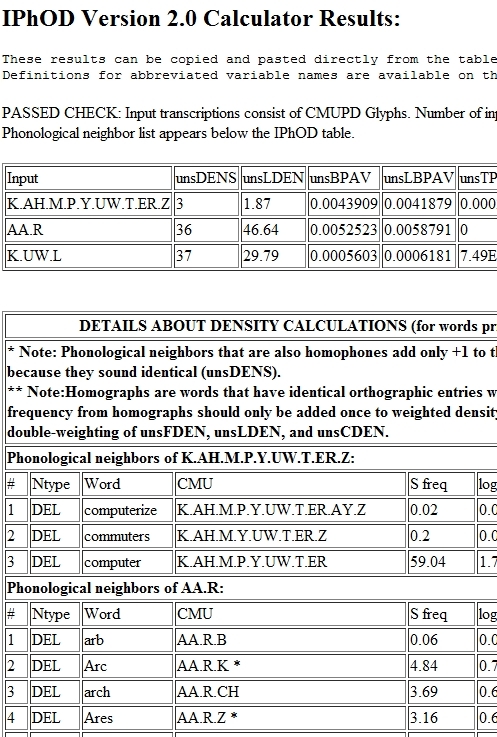 How do you obtain the phonotactic frequency or neighborhood density of a word that is not included in the latest version of IPhOD, or obtain a list of its phonological neighbors that are labelled according to homophones or homographs? Try the new IPhOD version 2.0 online calculator! The added feature calculates word-averaged phonotactic probabilities, neighborhood densities, and positional probabilities based on user-entered CMU transcriptions (Weide, 1994). This addresses an earlier limitation of the IPhOD version 2.0: only being able to search among words included in the ~50,000 word collection (or for a preset list of pseudowords). Prior to this update, if you needed to calculate values for new word or pseudoword transcriptions then you had to use values from version 1.4, which used different frequency weightings and a smaller word collection than 2.0. Each of those selections comes with four options for weighted calculations: unweighted raw counts, SubtlexUs frequency weighted (S Freq), log10 S Freq, and S Context-Dependent Counts. The word frequency weights are from SUBTLEXus (Brysbaert & New, 2009). At this time, I do not have plans to include syllable stress constraints in the calculator. Finally, if you click on the "Show neighbors?" button before running the calculator, then the calculator produces a cool-looking, second table that appears below the traditional calculator output results. The table contains every 1-phoneme different phonological neighbor with asterisks denoting words with homographs or homophones. Although the calculator adjusts to avoid double-weighting words whose spellings are identical, and only counts homophone neighbors as one neighbor (since they are indistinguishable by sound), it may be helpful for users to have that information available. If you start fiddling with the new features and either break something, raise questions, or discover a disabled button, please contact me. I have done my best to quality-check the new online calculator, primarily by comparisons of output from the online search and online calculator (v 2.0). Also, feel free to send me your suggestions for future extensions. The show neighbors function was a product of this blog, which has been quite an interesting and helpful development for me too. I hope that these new features will be a helpful resource for other researchers! Brysbaert, M. and New, B. 2009. Moving beyond Kucera and Francis: a critical evaluation of current word frequency norms and the introduction of a new and improved word frequency measure for American English. Behavior Research Methods, 41, 997-990. Weide, Robert L. 1994. CMU Pronouncing Dictionary. http://www.speech.cs.cmu.edu/cgi-bin/cmudict.